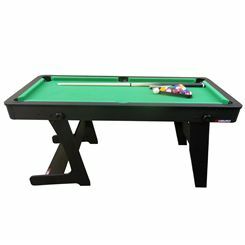 The Viavito PT100X is a stylish 5ft folding pool table that is solid and stable and plays excellently, and can then be folded away and stored more easily. This makes the PT100X an excellent choice when space is limited but you don’t want to compromise on the quality of the table, your play and your enjoyment. What’s more, the pool table’s beautiful and classic styling ensures that it will more than look the part in all homes and games rooms. It has been made to last and will endure serious play whilst also being suitable for fun with friends and family. 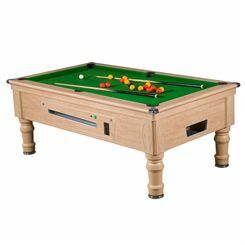 The surface plays very well and ball rebound is excellent on this 5ft (152cm) long table. When not in use you can simply fold it upright for space-efficient storage. The PT100X comes with all the accessories you need to get started and play including cues, balls, chalk, a triangle and a brush. 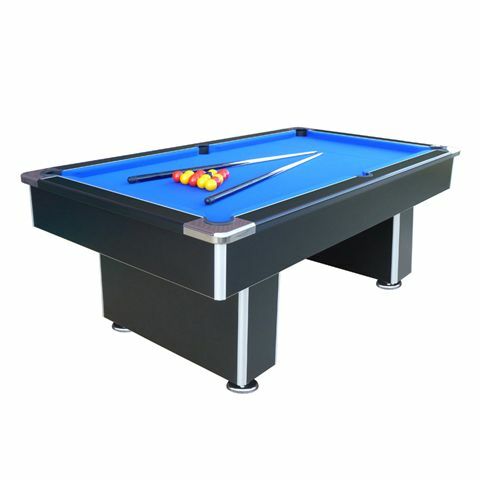 The Mightymast 7ft Callisto pool table features a beautiful smart black carbon finish with high-polish chrome corners and a hard-wearing quality blue cloth. 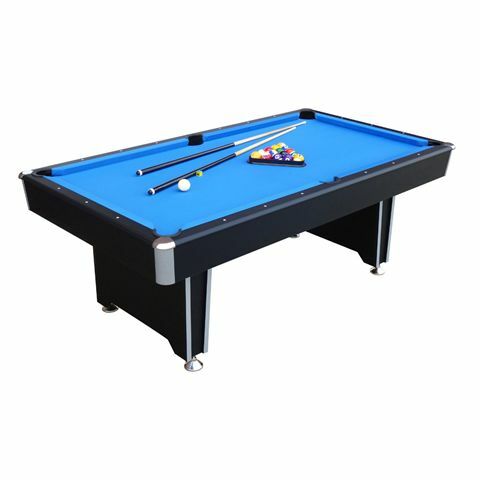 The Callisto pool table has a high density 1" (2.5cm) composite playing surface that ensures a professional game, adjustable height feet that enable customisation and fast-action high-response competition grade rubber cushions. This heavy duty professional American Pool table requires only minimal assembly and is supplied with all the necessary accessories to start the game. 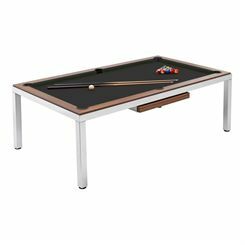 The Mightymast 7ft Speedster is a sleek and modern full-size professional slate bed pool table that will look great and bring hours of fun to games rooms and commercial places alike. The hinged 'lift off' top frame makes the table easier to manoeuvre and install, and assembling the table has been made simpler. The high-quality cloth, cushions and playing surface ensure excellent and true play. 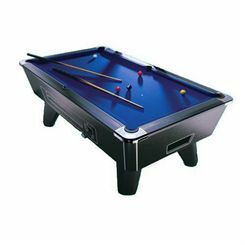 The Speedster is supplied with a set of tournament pool balls, a triangle, chalk, two full-size cues and a dustcover to get you playing straightaway. The presence of a pool table in the local pub is far from a modern phenomenon. Indeed in 1675 when the first book of billiards was published it commented "few Tones of note therein which hath not a publick Billiard-Table." Even prior to that, pocket billiards as it is also known is mentioned in Shakespeare’s ‘Anthony and Cleopatra’. Pool evolved in Europe from a lawn game similar to croquet some time during the 15th century. Tables with pockets were constructed to bring play indoors and the ball was shoved with a mace as opposed to being struck by a cue. In the initial stages the edge of the table was a simple border which didn’t really factor in the game, a rail was added later to prevent the ball from falling off the edge and eventually it became part of play when rebound shots began to be made in the latter part of the 17th century. Cue development soon followed because if the ball was near the rail it was awkward to use the mace owing to its large head. So players improvised by turning the mace around and using its “queue” (meaning tail) to strike the ball- hence the name “cue”. Today there are countless versions of the game although the most popular game is undoubtedly 8- ball where seven balls of different colours are pocketed by each player in a race to get the eighth black ball in a pocket. 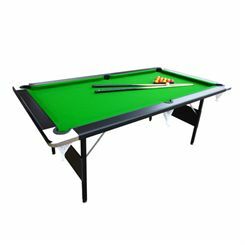 Tables come in a variety of sizes, the smaller ones at 4’ 6” long are appearing in a growing number of homes while at the larger end the 9’ tables are found in sports pubs, snooker halls and recreation facilities. If you’re in the market for a table of your own size is obviously the primary factor and your space needs to be adequate to house both the table and the cue all the way around it as shots are taken. A number of great quality tables do fold away and can be stored while others double up as tennis table tables and have wooden covers so they can be used for dining too. Materials are also important. The smaller, portable tables will generally be made of light wood but if your table is a permanent feature there are some amazing materials and designs on the market ranging from carved oak with leather pockets to solid slate tables with an individual choice of cloths and colours. Whichever you chose check that your table legs can be levelled, most are adjustable so you can create a flat playing surface and make that first break on a table of your own.